Winners at Snow Carnival of the South. 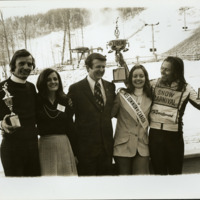 Picture taken by George Flowers of unnamed winners at the Snow Carnival of the South on the top of Beech Mountain in 1973. The winners are posing with a man in a suit in a congratulatory manner. 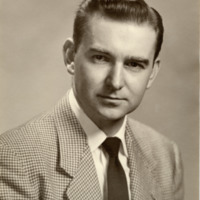 Self-portrait of Palmer Blair clean shaven, wearing a checked suit and solid tie, probably in 1947. 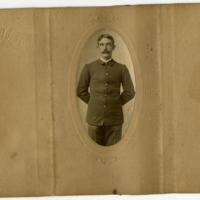 Image is glued into a tri-fold photo holder and shows a man with a handlebar mustache in a tight-fitting suit posing in a studio shot. 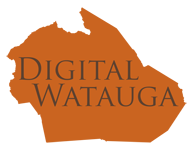 No studio is indicated.